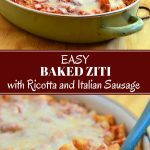 Easy Baked Ziti with Ricotta and Italian Sausage is the ultimate comfort food the whole family will love. Make ahead or freeze for later; perfect for busy weeknight dinners! 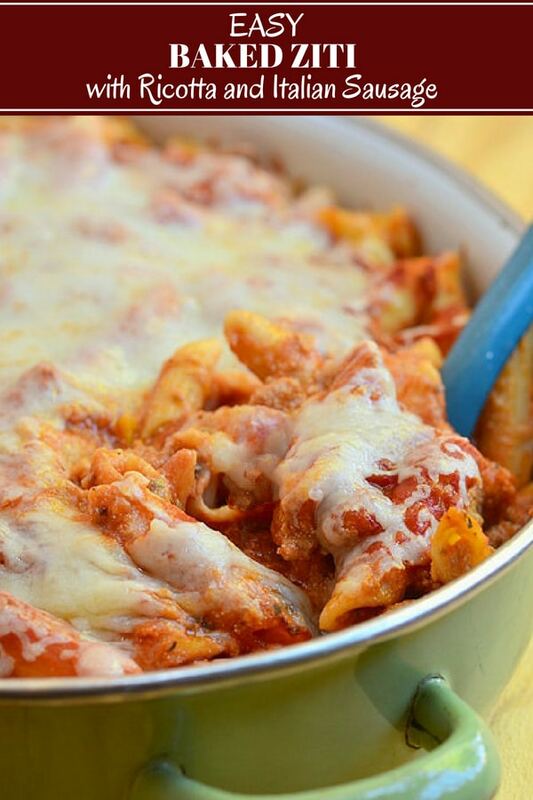 Pasta casseroles are my go-to for weeknight dinners. 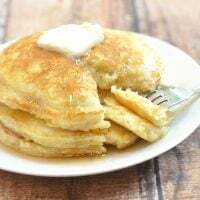 They’re so easy to prepare and can be made ahead and frozen for later; perfect for when I am pressed for time or just too lazy to cook. 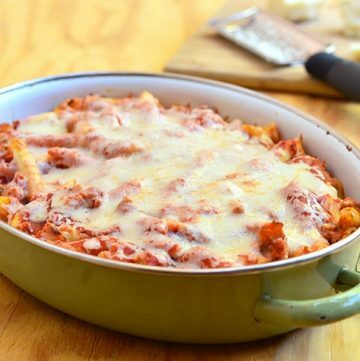 We have a few variations on regular meal rotation, and this easy baked ziti is one of our big favorites. A delicious hodgepodge of hearty noodles, spicy Italian sausage, chunky tomato sauce, mushrooms, sweet peppers, creamy Ricotta cheese, and gooey Mozzarella, it’s the ultimate comfort food! 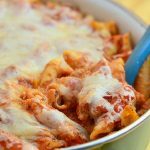 Can you use Penne for Baked Ziti? Yes, you can! Any tube-shaped pasta that will hold the meat and sauce well will make a good substitute in this recipe. 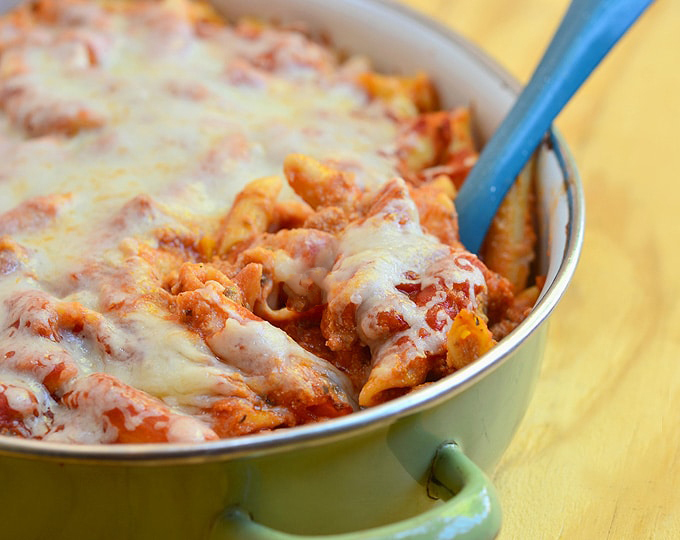 Can Baked Penne be Made Ahead of Time? Definitely! Prepare according to the recipe except the baking. Use an aluminum pan or a freezer-to-oven safe baking dish, cover tightly, and refrigerate for up three days or freeze for up to 3 months. From the fridge, bake in a 375 F oven for about 20 to 25 minutes or until heated through and bubbly. 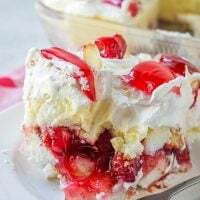 From the freezer, thaw overnight in the refrigerator and bake in a 375 F oven for about 20 to 25 minutes or bake frozen in a 375 oven for about 1 1/2 to 2 hours or until completely heated through. Want more easy pasta ideas? These cheeseburger pasta and creamy salsa verde pasta recipes are ready in minutes and in one pot! 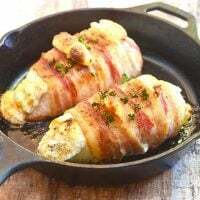 In a large pot over medium heat, add Italian sausage and cook, stirring and breaking apart with the back of a spoon, until lightly browned and releases fat. With a slotted spoon, remove meat from pan and set aside. Discard grease except for about 1 tablespoon. Add onions, garlic, sweet peppers, and mushrooms and cook until softened. Add browned sausage back to the pot. Add wine and cook, stirring occasionally, for about 2 to 3 minutes or until reduced. Add marinara sauce, crushed tomatoes, and tomato paste. Stir to combine. Bring to a boil. Add Italian seasoning, red pepper flakes, and sugar. Season with salt and pepper to taste. Lower heat, cover, and simmer, stirring occasionally, for 20 to 25 minutes or until meat is cooked through. In a pot over medium heat, heat about 4 quarts water to a boil. 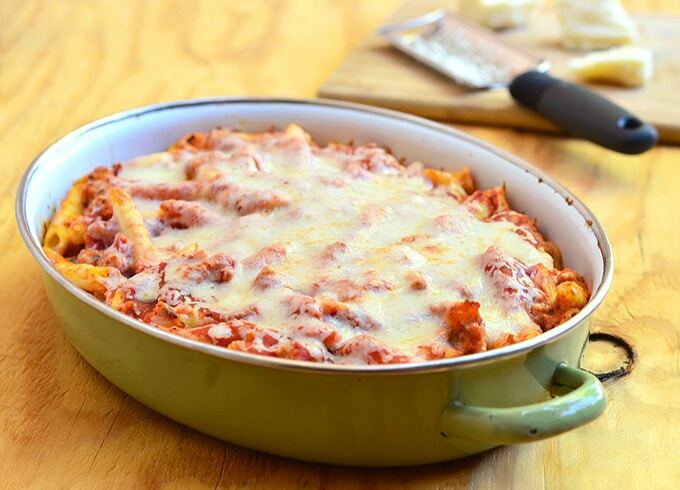 Add ziti and cook for about 1 to 2 minutes less than the package directions. Drain and rinse under cold running water. 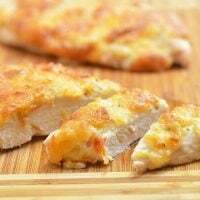 In a large bowl, combine ricotta cheese, Parmesan cheese, and 1 cup of the mozzarella cheese. Add egg and gently stir without over mixing. Add the pasta and 3/4 of the meat sauce. Gently toss together. In a 9x13 baking or casserole dish, transfer pasta mixture and evenly spread. Spoon the remaining 1/4 of the meat mixture on top of pasta. Sprinkle remaining 1 cup mozzarella cheese on top of meat mixture. Bake in a 350 F oven for about 20 to 25 minutes or until heated through and the top is golden and bubbly. Remove from oven and let stand for about 5 minutes before serving. Would like to give my daughter potato recipe. She is teacher in KY.